Technology has made things easier for us like never before. It is a well-accepted fact that most of our tasks that are completed successfully, involve the use of technology in it. Same is the case if we have a look at the food processing. To prepare our daily meal, we too have to be dependent on food processor in this day and age. A food processor is a kitchen appliance used to facilitate repetitive tasks in the preparation of food. The food processor has made our kitchen life easier, and we can easily make our food within a short span of time. Imagine! If we were not using a food processor in our kitchens, we wouldn’t be having so much ease to cook our food fast. Well, technology brings revolution in every industry and revolution brings some benefits to its users as well. In this article, we aim to review and throw some light on KitchenAid Food Processor and KitchenAid food processor attachment. To start with, it may not be the fanciest machine around, but it does everything you need it to do consistently well. 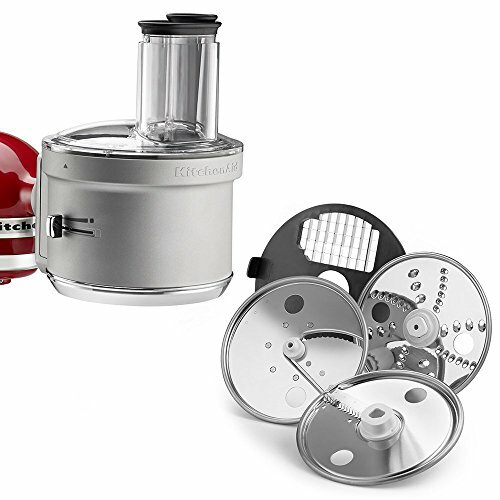 KitchenAid’s newest food processor features the first-ever ExactSlice™ System, providing the power, precision and control you need to make everything from pie crust to pesto to perfectly prepared crudités. The Food Processor attachment simply attaches to the hub of your stand mixer to dice, slice, shred and julienne your favorite fruits, vegetables and hard cheeses. High-quality food processors have strong motors and heavy bases that anchor them to the counter so that they can mix sturdy yeast dough. Low-quality machines, which also happen to be lighter, will often skid across the counter when processing dough, or the motor might even seize up. This one has sure got its foundation strong as it comes with a robust motor which gives it strength and durability. Exclusive ExactSlic System – Kitchenaid food processor dicing kit’s exclusive ExactSlice System gives you precise slicing and accuracy for all kinds of food—hard or soft, large or small. Attaches to Power Hub – On your stand mixer and uses the power of the motor to operate the attachment. Wide Feed Tube – Accommodates various sizes of food for less prep work. Spiralizer Attachment – kitchenaid food processor blades allow nine different types of spiralizing, slicing, coring and peeling. You can put a new spin on all your favorite recipes. Not a Comprehensive end to end solution – This is not like a regular food processor where you can put food in to mix together. It only cuts, slice, dice, etc. Get processing with your KitchenAid Stand Mixer. The Food Processor attachment simply attaches to the hub of your stand mixer to dice, slice, shred and julienne your favorite fruits, vegetables and hard cheeses. The exclusive Exact Slice System allows you to slice from thick to thin with one slide of the lever. It stands out in its league when it comes to quality and product design. It is definitely the best choice for most home cooks. It is way more durable than other processors at this price range. The cup bowl is better than smaller versions for blending wet ingredients and processing big batches of shredded slaws and grated cheese. It even makes dough at par with or better than that of models with specific dough speed. It chops vegetables and herbs evenly (without pulverizing them), grates veggies and cheese uniformly, slices cleanly, and finely grinds bread crumbs, nuts, and other dry ingredients. These sort of state-of-the-art machines are most useful for small jobs, such as chopping up one onion, making a curry paste, preparing salad dressing, or a doing small batch of pesto. Because of its compact size, it can be easily tucked into a cupboard and can be brought out when needed. The Kitchenaid Food Processor and KitchenAid food processor attachment- does everything that a great food processor should do without any unnecessary extras that would boost its price. It’s simply designed and it works as well as or better than machines with multiple bowls and more attachments. It comes with just the right number of blades and disks, as all of them will stow inside the mixing bowl, so you won’t need to store a big box of attachments. The simply designed base and jar were also easier to clean than most of the competition. KitchenAid’s food processor attachment allows you to shred, slice, julienne, and dice fruits, cheese, vegetables, and meats in seconds! It comes along with a slicing disk, a reversible shredding disk, a julienne disc, and a dicer kit. Flaws but not spoilers – At first this food processor seemed a little puny next to the other models, which boasted nesting bowls, taller bases, and big boxes of attachments. But after two days of testing, its simplicity won us over. Like any other product, this one has its fair share of disadvantages but its minor limitations didn’t negatively affect its performance. It chops vegetables, grind bread crumbs, and shreds soft mozzarella just as skillfully as the other and more expensive models do, and it takes up less counter space. With some careful layering, you can store all of the blades and disks in its work bowl with the lid on, which saves a bit of storage space (and keeps you from gouging a hand on a loose blade in a drawer). Overall, a great product and a one stop solution for all your kitchen needs. We are definitely impressed with KitchenAid Food Processor and KitchenAid Food attachment and would recommend a strong go ahead.